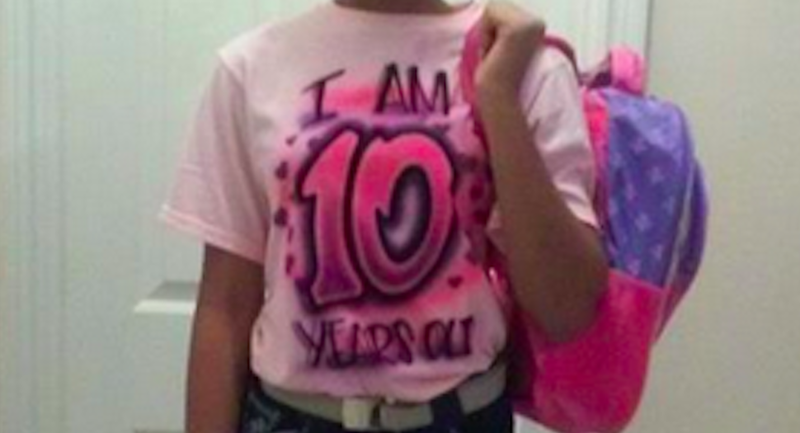 A 10-year-old girl was masquerading as a full-on teenager until her father found out and crafted a special punishment — an age appropriate outfit including a pink t-shirt that screams "I'm 10 Years Old." According to Kevin Jones' Facebook post, he caught his daughter pretending to be years older than she actually is, running a number of secret social media accounts and dating a boy (!!! ), all of which are against his house rules. In response, Jones decided to not only make his daughter dress her age with barrettes and a kiddie cartoon backpack. He also put her sartorial punishment on social media so all of her friends and strangers could see her new look. And, thanks to Facebook, his daughter's humiliation quickly became very public; as of Tuesday afternoon, more than a quarter million people have "liked" his post. As a tall kid myself, I distinctly remember a grown man asking me if I was married when I was only 12. I was so shocked I couldn't formulate a response. My mother stepped in like a panther and growled back, "She's 12." The adult man ran away. I wasn't trying to look older—sometimes it just happens. That said, Jones probably realized that his daughter's social media habits could have been unwittingly making her vulnerable to predators and putting her in real danger. So, kudos for originality and reach, Mr. Jones—though I really wouldn't want to be that poor 10-year-old girl today.